Hardwood floors are undoubtedly a hot commodity in homes today! Many new homeowners are on the hunt for a home with the perfect mix of hardwood and tile floors. Likewise, many current homeowners are taking a close look at their renovation budget to see if they can make the investment in hardwood. Once the investment is made, and the beautiful hardwood floors of your choosing are installed, then what? Caring for them can be overwhelming thanks to the bounty of chemicals, cleaners, and tools filling home improvement store shelves. However, trusting claims on a label can be an expensive mistake. … use cleaners that won’t leave a film or residue. … use a light cloth to rub out occasional scuffs and heel marks. … use a lightly damp towel or sponge to wipe away sticky spots. … use as little moisture as possible to clean the floors. … clean up spills immediately. … hire a professional company to safely clean and maintain your floors regularly. … use wax with a urethane finish. … use ammonia cleaners or oil soaps. Ammonia cleaners will dull the finish on your hardwood (and granite) almost on contact. Plus, oils will make surface recoating down the road more difficult. … use excessive amounts of water (like a mop or sopping wet sponge) to clean the floor. Just as you shouldn’t leave a puddle on your antique wood dining room table, you shouldn’t leave water on the floor either. The excessive water can get caught in the cracks in the floor, or be absorbed into the wood, causing it to warp, crack, and lost its integrity. If you have pets, it is a good idea to think about putting down a few area rugs in areas where they gather … such as under their food and water bowls, and perhaps by doggie doors or their beds. If a pet has an accident or their water bowl spills, just wipe it up quickly then clean it with a damp cloth before it can seep into the wood. Professional floor care companies have technicians who are well trained in using the right products and equipment to clean various surfaces – including hardwood. A good professional cleaning isn’t just going to shine up the surface of the wood; the intensive cleaning actually removes dirt and grime that has become embedded in the floor. The longer those contaminants are left in the floor, the more damage they can do over time. Plus, there are tools to reach even the most hidden corners and spaces. Plus, if your floors are looking a little dull, it might be possible to get that like-new shine back without total refinishing. 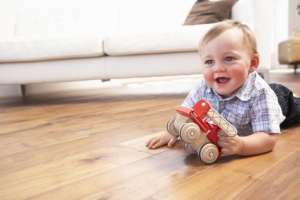 Keeping your hardwood floors clean is easy if you adopt a regular cleaning routine. You can expect to need to dust them often and wipe away spills quickly. Beyond routine cleanings, it is wise to hire a professional cleaning service, like Made New Again, to help keep your floors in tip-top shape as long as possible!